Hallux Limitus (limited and painful movement of the big toe joint) is also know as Hallux Rigidus and arthritis of the great toe. First, the cartilage begins to wear inside the joint. Sometimes holes or depressions develop in that surface, as the cartilage wears through. The movement of the joint gets smaller, and pain tends to develop. As the condition progresses, the cartilage is worn away, and all that remains is the two raw bone surfaces rubbing together. Bones can't function well without the cartilage between them, joint movement worsens, and the bones become more and more misshapen. 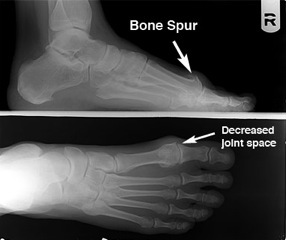 The joint surface tends to flatten on each side of the joint, and projections of bone know as "spurs" develop. At this stage, the way the patient walks, the "gait", begins to become altered. Eventually, the motion gets so bad that the two bones can fuse together, completely obliterating what was once a joint. What symptoms does arthritis cause? The degenerative process causes two major problems: pain, and loss of motion of the big toe joint. This can also cause alteration in the way a patient walks, so other parts of the foot, knee, hip and back are frequently affected. Diagnosis of hallux limitus is made by both physical examination of your foot and by x-ray examination. There is a commonly mild swelling and bony prominence associated with the first metatarso - phalangeal joint behind the big toe. X-ray examination of the foot will reveal the true severity of the condition. It will allow the physician to evaluate the joint for bone spurs, decrease in joint space, flattening of joint surfaces, and loose bodies in the joint. 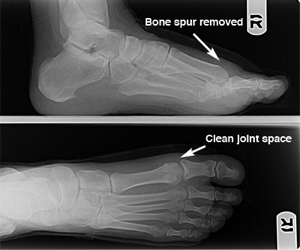 X-rays can also reveal the causes of hallux limitus such as an elongated or elevated first metatarsal. First, you can try symptomatic relief, that is, just making it feel better. Rest, ice, anti-inflammatory medications, steroid injections, physiotherapy, and massage may all help. At least temporarily. Second, and more importantly long term, you can try to identify the cause of the problem, and attempt to correct this cause. Orthoses (orthotics), for example, can be used to increase what motion still exists in the joint, or if the degeneration is bad enough, both orthoses and special shoe modifications can limit pressure on the spurs, and limit the painful motion that remains in the joint. The joint can also be treated by the injection of Steroid which reduces the pain from the joint. The final option is to attempt to fix the condition surgically. What would be done to fix the joint surgically? These procedures have the advantage of being easy to perform and allowing for quick recovery. Cheilectomies, however, do not do anything to address why the hallux limitus developed. So using this procedure where it is not indicated will tend to create a return of symptoms and may make the patient undergo more surgery in the future. For these reasons, other procedures that attempt to correct the cause may be better choices in the long run, however. 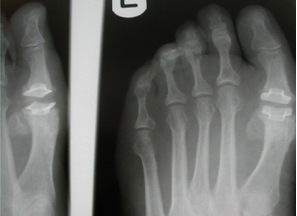 For example, if the cause of the condition is an excessively long first metatarsal, a procedure designed to shorten the metatarsal would be considered. Alternatively, the metatarsal may be lowered if it is too high, stabilized if it is too mobile, realigned if it is crooked, recontoured if it is irregular, and so forth. Range of motion exercises are encouraged afterwards for these procedures, and recuperation is usually quite rapid. The Keller procedure involves removing the base of the big toe joint. As you can see in the illustration to the left, there is a great deal of arthritic changes in the great toe joint. The Keller procedure involves removing the base of the first toe bone, to remove the arthritic bone surrounding the joint and limiting motion. (See illustration below.) Usually surrounding soft tissues are positioned between the remaining bone surfaces to prevent further bone-on-bone wear. The Keller procedure is quick-healing, and it increases range of motion tremendously. This helps the patient return to a more normal gait, but the patient loses some push-off power in the toe joint. Future surgery is rarely needed. The joint could be fused. In other words, instead of removing bone, you attempt to eliminate the joint and allow the two bones to grow together in a fused position. Known as an arthrodesis, the advantage to this is that without motion of the joint, pain is usually resolved. The disadvantages are that this procedure is slow-healing, sometimes requiring months to become solid, and the result is a motionless great toe joint, which can change the way the patient walks. Alterations if shoe gear may be necessary, and other joints frequently begin to become troublesome, as they must make up for the loss of great toe joint motion. It is also somewhat more to reverse if the procedure proves to be problematic. Removal of the damaged joint surfaces, followed by the insertion of screws, wires, or plates to hold the surfaces together until it heals. Used for patients with severe bunions, severe arthritis, and when other procedures have failed. This is a joint arthrodesis, a fusion of the joint so that is will no longer hurt. It will not move after this procedure. This is a joint replacement. It allows full range of movement when in place. There are many types of surgery to treat hallux limitus. Each person can have a sligthly different variation of this problem. You will need to book a consultation to discuss your individual needs. Surical procedures vary from small bone cuts to remove the excessive bone growth, a cheilectomy the repostioning of bone shapes, to joint replacement or joint fusion for severe cases. Some of the surgical procedures that could be performed for this condition is listed below. Bonney-Kessel Procedure This procedure involves a pie-shaped piece of bone being removed from the big toe to allow the toe to "dorsiflex" or bend up. In the right applications it may allow the patient to roll forward off the bent toe, without causing excessive painful bending the big toe joint. Waterman Procedure Similar to the Bonney-Kessel, the Waterman involves a pie-shaped wedge of bone cut to be made in the first metatarsal instead of the big toe. It is classically done in the "head" of the first metatarsal bone, behind the big toe joint. Lambrinudi Procedure The Lambrinudi procedure basically consists of a long, pie-shaped wedge of bone to be made in the shaft of the bone. When the triangular-shaped piece is removed, the bone is able to "plantarflex," or drop. Giannistras Procedure The Giannistras consists of a Z-shaped bone cut when viewed from the top of the bone. This cut allows the metatarsal to be lowered and shortened as necessary to help the joint function. It is typically held in place with two screws. It is less stable than other procedures, but allows for substantial correction in severe cases. Plantarflexory Kalish Procedure or Plantarflexory Offset V Procedure This procedure is similar to the Lambrinudi except that it involves an interlocking "V" shaped into the bone cut (when viewed from the side). This interlocking "V" cut allows for more stability in the bone cut and allows for quicker ambulation post-operatively. Youngswick Procedure Devised by a California podiatrist named Dr. Fred Youngswick, this common modification to the Austin Procedure allows the surgeon to shorten and drop the metatarsal head, in cases where arthritis and limitation of motion is developing at the great toes joint. To allow the head of the bone to be raised or lowered, there is the Reverdin-Green-Laird-Todd procedure. In this procedure a triangular-shaped wedge is removed both from the top and from the side. This procedure allows one to correct a bunion in three dimensions. An example is demonstrated with the x-ray on the right.